If you are a Web, Game, or Mobile App Developer, here is some Great News for you! 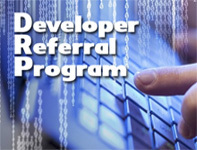 This year Swipetec Merchant Solutions created the Developer’s Referral Program, which not only provides the developer with a robust virtual payment solution to integrate into their projects, but also an opportunity to get PAID... Again and Again! As an incentive to join our program, you will receive a 15% split on all of the credit card transactions generated from your projects that use our payment processing services for the LIFETIME of the account! The illustration above shows about 23 CENTS that would be credited to you for 1 TRANSACTION! Swipetec has a multitude of online merchants that process in the excess of $750K monthly. This isn’t a math quiz, but you can clearly see how being a part of our program could benefit you and/or your company for years to come! The beauty of this program also gives you the freedom to convert previously delivered projects that you developed in the past. Simply get a copy of your client’s most recent Merchant Services Processing Statement, and we’ll do a FREE and without obligation Statement Analysis for you. That “to the Penny analysis” will show what your client is paying now, and what they could be paying and saving with us – this could be the leverage you need to convert for yourself yet another Revenue Stream! We’ll even help you convert it if necessary… Just call us for any additional assistance needed, and we’re more than willing to help in any way that we can! Enhance your portfolio by referring a fellow business owner! Give your colleagues and friends a chance to know where they stand. If they switch you’ll get the credit, and automatically qualify for a monthly residual for the life of the account!!! This program is as easy for you as 1-2-3... Because there is No Red Tape - No Buy In – No Program Membership Fees or Dues – No Minimum Monthly Quotas to meet to qualify for your monthly residuals – Track the status of your residual payments 24/7 in Swipetec’s CRM - Residuals Paid for the Life of all Accounts... Guaranteed! All that is required of you is the Referral. Get Started Now on building your portfolio, and increasing your Bottom Line!! Even if you don't have a project from the past or presently that you can refer, tomorrow offers many opportunities to create new streams of revenue - Sign up TODAY!!! *Please note: A Swipetec merchant account is required for all referrals. Approvals are fast and usually obtained within 24-48 hours. Click here to obtain Merchant Application.